Much like its bigger brother, the Cigar Caddy 3240 10-Cigar Waterproof Travel Humidor is a wildly popular choice for avid cigar lovers who want to keep their cigars humidified and protected from the many perils of travel. And as with the Cigar Caddy 40, this little jewel is built with tough ABS molded plastic that combines with an airtight seal to deliver a humidor that floats and is waterproof to a depth of 100 ft. The humidor lid holds its tight grip by way of removable locking clamps and stainless steel latch hinges, which like the larger Cigar Caddy 40 may pop off from time to time, although this small inconvenience is an easy fix and well worth the effort. The interior of the travel humidor features a humidification disc which will keep up to 10 cigars ready for action at a moment’s notice. Two removable foam pads, each with 5 slots, keep the cigars gently, yet firmly in place no matter how rough the terrain. The foam pads can indeed be removed for added space which will definitely come in handy, as the slots are not big enough for some of your larger diameter smokes. Removing the pads, however, will make the cigars less protected and more prone to damage, so do so at your own risk. All in all, though, this humidor is as versatile and as reliable as they get. 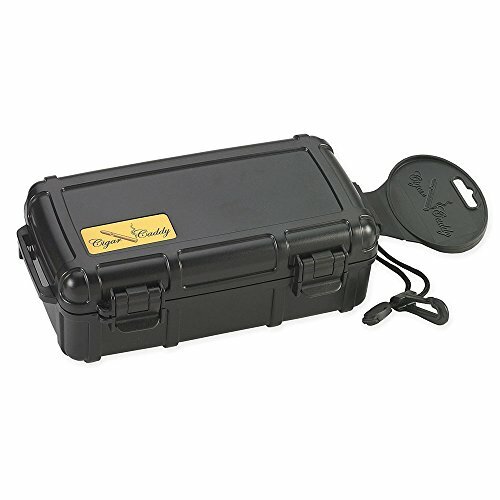 With an included lanyard for ease of carrying, the Cigar Caddy 3240 10-Cigar Waterproof Travel Humidor is an ideal option for any and all cigar aficionados and will prove a valuable addition to any cigar kit. Whether for the home, the office, for the golf bag, the briefcase, the backpack, boat, car or truck, the Cigar Caddy 3240 10-Cigar Waterproof Travel Humidor has got your back, making it one of the best travel humidors.